I had come across images and information in Shawon's book on a small hamlet where the men used a process of collaborative hammer-working to produce brass, bronze and bell metal products. I wanted to see and learn more. Tushil and I made our way across many fields to get to the small hamlet. There are now only two workshops here, both producing metalwork and using similar processes. When Shawon wrote his book there were around 5 workshops. 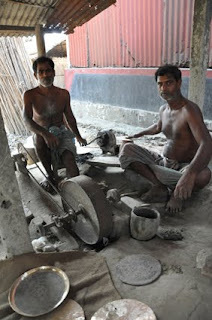 In an interview with one of the workshop owners he recalls there were once twenty in the village. At the time I visited, the first workshop was forging out flat discs of the metal, stretching them to the correct diameter, forming the edges and cutting the rims. 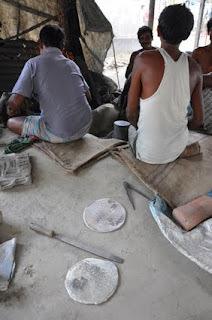 These discs are made into school gongs, temple gongs, ritual dishes or engraved trays for the home/ tourist market. 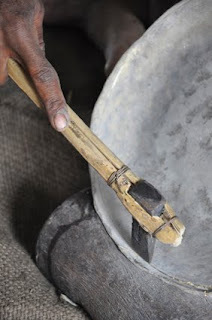 To get the discs the men cast a brass or bronze 'bell-metal' mix called 'pitol', from scrap. 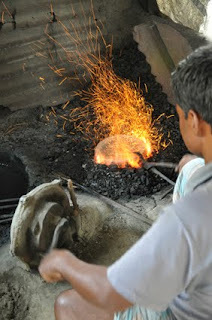 The molten metal is poured into an open shallow mold to make a flat circular ingot. To stretch the cast discs the men sit around a sunken metal stake and hammer in sequence, using beautifully shaped hammers. The rhythm of the work is musical. 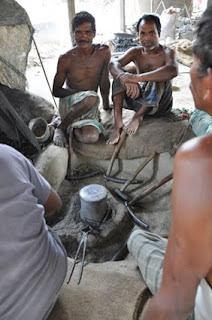 See an overview of the workshop and the processes here: Bangladesh Metalwork - Hammerwork. 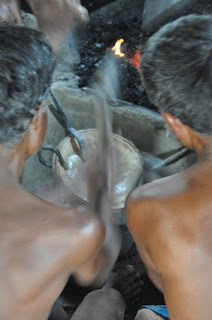 Together the men then forge up to 8 of the ingots at a time into thin sheets, working together to stretch the hot metal. The way the men work is wonderful to see. The hammer-work develops as more and more of the men start to hit the metal. 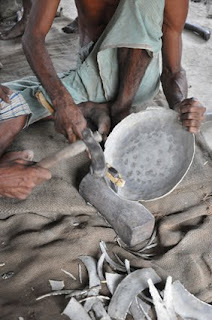 As each individual adds to the hammering process his first blow is struck then he misses a beat, indicating his addition to the sequence of blows, he then joins in at the faster pace. The finish is also signaled by a change in sequence of the hammering, some blows are placed to the centre and sometimes the direction or order of the blows is reversed or changed. The man controlling the fire moves the plates through the stack to ensure that they are all heated and stretched evenly. When the team are hammering he controls the stack of discs rotating and positioning them carefully to get maximum effect from the hammering. 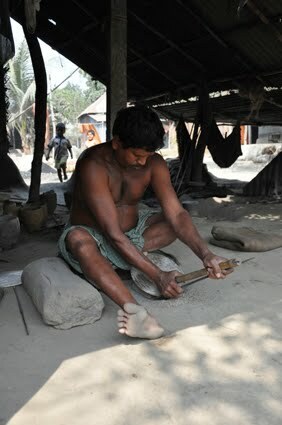 Watch him rearranging the stack here: Bangladesh Metalworking 05. The discs are formed using a hammer over a stake or working the metal into a indentation in a stone, set into the workshop floor. There were examples of the crucibles, some filled and ready to be capped and heated for the casting process, others stacked ready for to be filled. 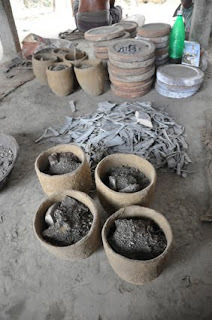 The large ceramic discs in the image below are the moulds where the molten metal is poured. 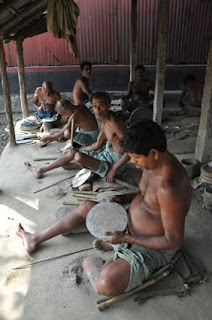 Like in the previous workshop, the men worked on the discs, forging and stretching them out. others were planishing knocking out the worst of the dents and even-ing out the metal. Sometimes the scraping was by hand, using hardened steel blades set into a bamboo shaft. The sharp scraper is supported by a steel bar which the craftsman holds between his fingers and is tensioned against the edge of the disc. As he works the scraper on the surface of the disc he releases his grip allowing the scraper to move, in a controlled way, across the disc towards the centre. The disc is held in position by three pieces of material. The first is a small stake in the ground with a slot cut into the diameter, this holds the base of the disc. The second is a stick, which again has a slot cut into it, and this supports the top of the disc. This is held in place by the weight of the crafts mans leg bearing down upon it. The third is a larger lump of wood / a brick or pad of cloth which sits behind the disc and supports it from flipping sideways or slipping backwards. 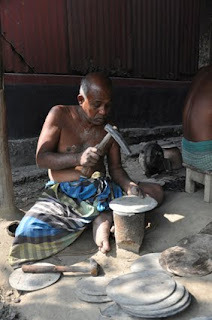 The whole of the craftsman's body is used to secure and work the piece. The workload is very physical and the men's heels wear impressions into the ground. The scraping starts at the edge and moves toward the middle, the disc is rotated to work across the whole of the surface, producing these interesting patterns as the marks, from the scraping, catch the light. The shavings from the brass are re-melted to make more discs. The scrapers are honed using emery on hardwood logs. 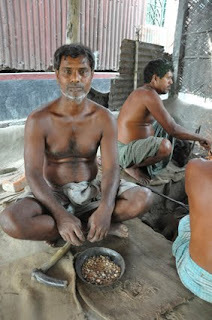 The men, as in most workshops I have seen in Bangladesh, work on the floor. 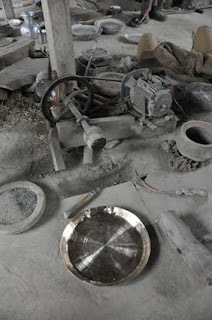 Sometimes the scraping was done on an improvised lathe where the disc of metal is attached to a block of wood, which is, in turn, attached to a motor or bicycle chain machine. 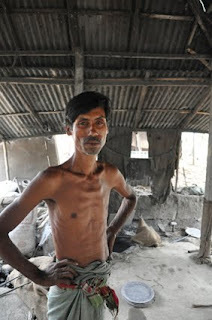 Much of the technology here is based upon work without electricity, using as much locally sourced materials as possible. The metal is held in place by using heated plant resin as an adhesive. The resin is softened over a small ceramic kiln filled with burning charcoal, again heated with the aid of a small, hand powered, fan. When in position, the disc (and the resin) are quickly cooled using damp cloths. The resin hardens as it cools and this secures the disc in position. 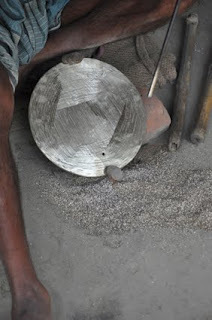 A stick with a metal ferrel at its end is used to make the disc run true. 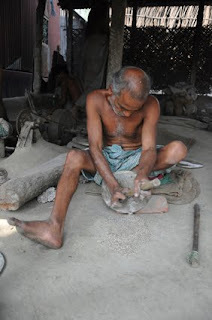 This is controlled by the left foot, as both hands are occupied with the disc and the lathe.